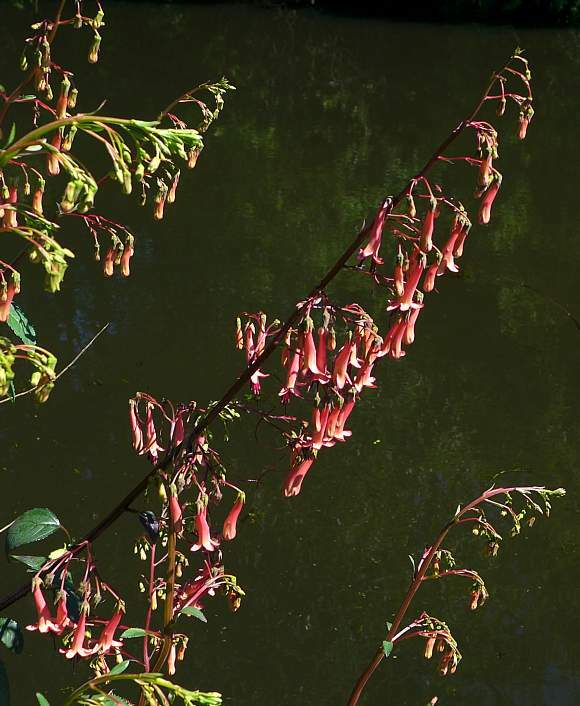 Grows up to 1.5m high alongside rivers, canals and any other freshwater course. 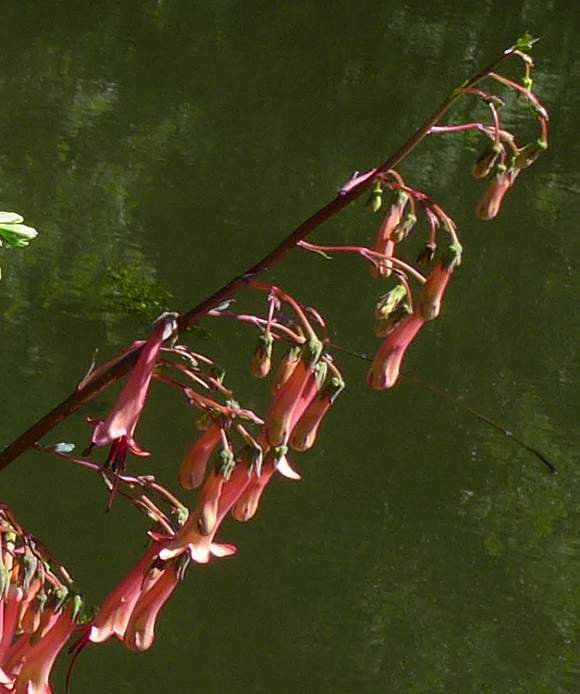 Flowers in an erect tiered spike from nearly-opposite pairs of short branches (this arrangement is called a panicle). 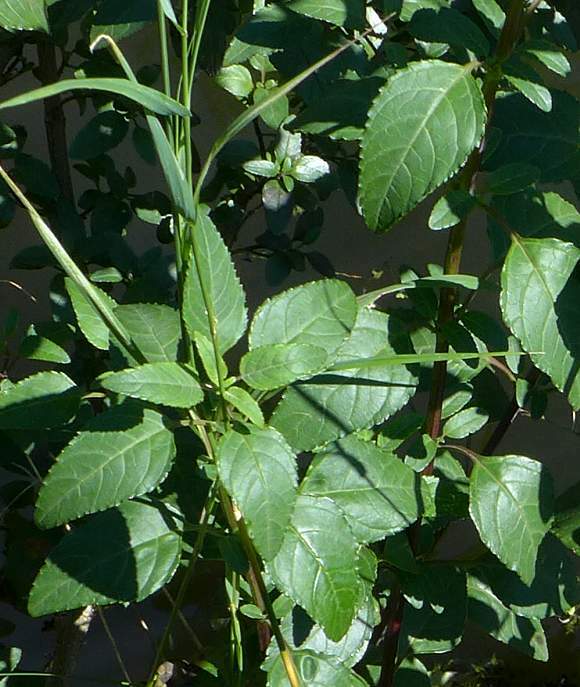 Leaves have a satin sheen and are a greyish-green and are in opposite pairs, with pairs of smaller side-leaflets and a large terminal leaflet. The flowers all droop downwards and a red but becoming a lighter shade of orange or pink towards the opening. 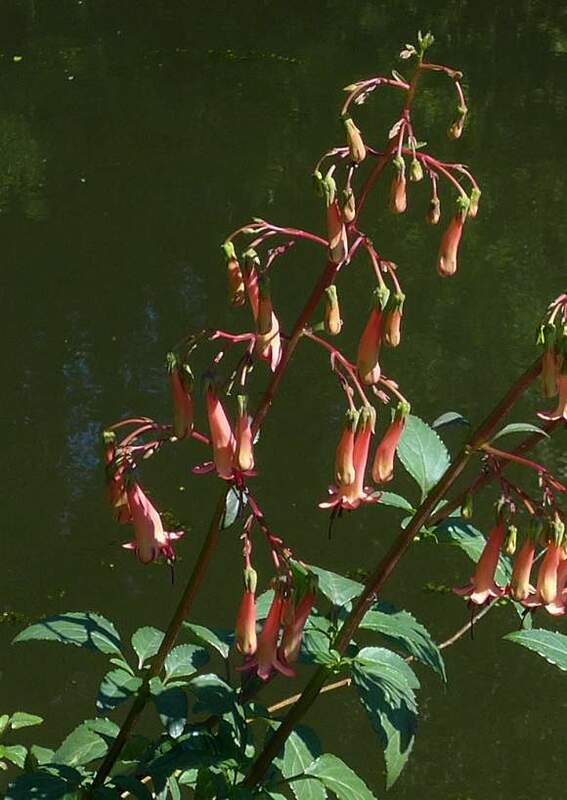 The flowers are tubular, with a long trumpet shaped opening up at the end into 5 equal petals. 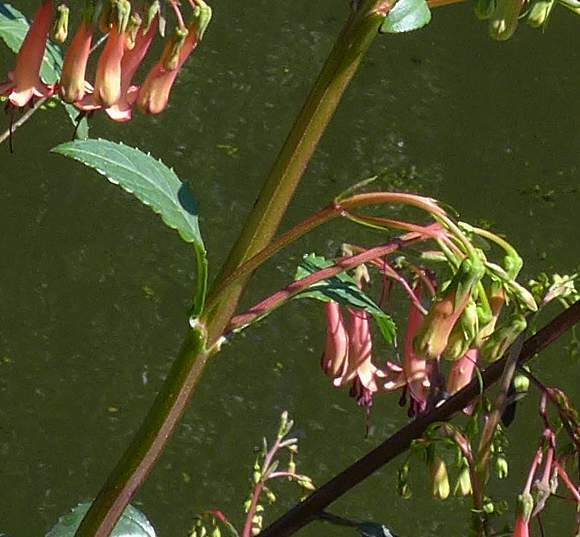 The (branched) flower stalks emerge at ~right-angles to the main stem. 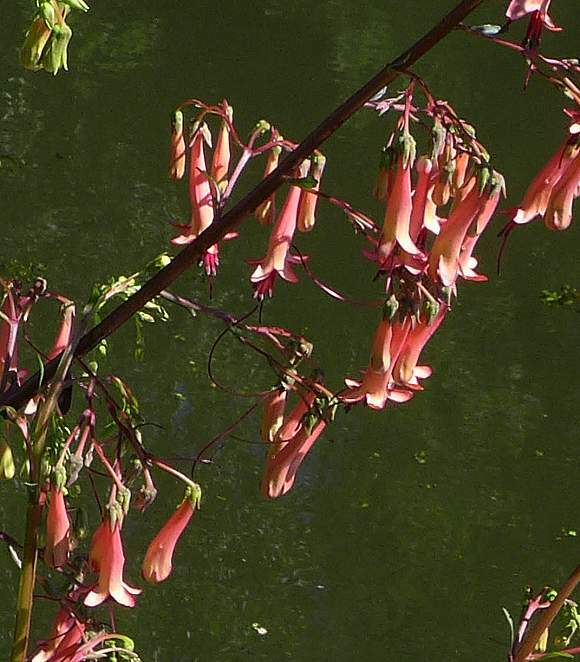 The flowers have 4 purplish or deeper-red stamens with pink or violet anthers. The stems are square with slight raised ribs on the 4 corners. The sepals are cut more than halfway into 5 long triangular teeth (right). The leaves are on fairly short stalks and ovate in shape with crenate-serrate teeth (have many quite fine sawtooth-shaped teeth which alse bend slightly upwards at their tips). The stamens are exserted (stick out from the corolla). 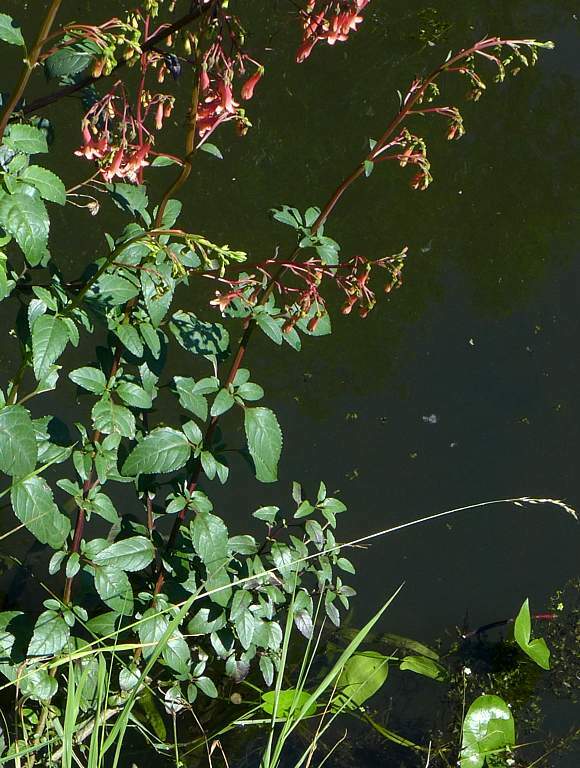 It is a neophyte and broadleaf semi-evergreen shrub which is grown in gardens but can escape to the sides of fresh water such as lakes, rivers and canals. It has a long flowering season from May to November and is native to South Africa where it was used to inebriate boys in some sort of initiation ceremony. 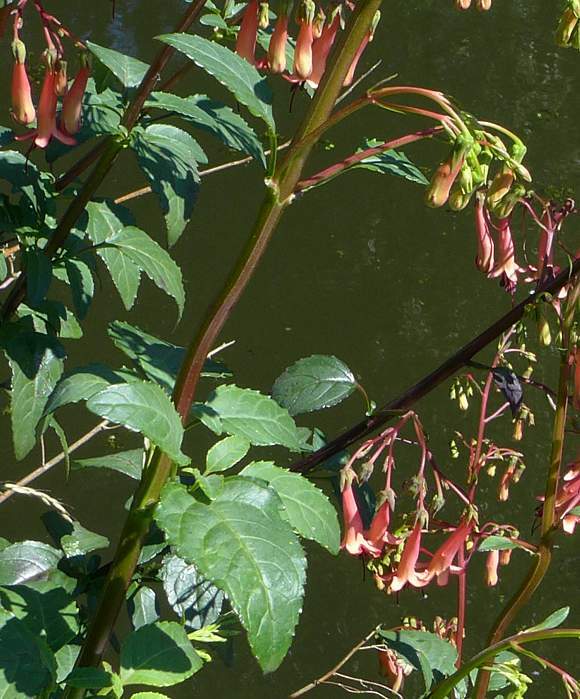 The long tubular flowers resemble those of: Red Tobacco (Nicotiana forgetiana), Angel's-Trumpet (Datura ferox) but those flowers are white, Cigar Plant (Cuphea micropetala) but although it has a long red tube that does not escape into the wild in the UK, Californian Fuchsia (Zauschneria californica) which also has red flowers but they stick out sideways, Hedge Fuchsia (Fuchsia magellanica) which has red flowers which hang downwards but they also have much longer petals (and only four of them) and an extra purple skirt from which the red anthers are exserted. There are many others. However, none of these have square stems! 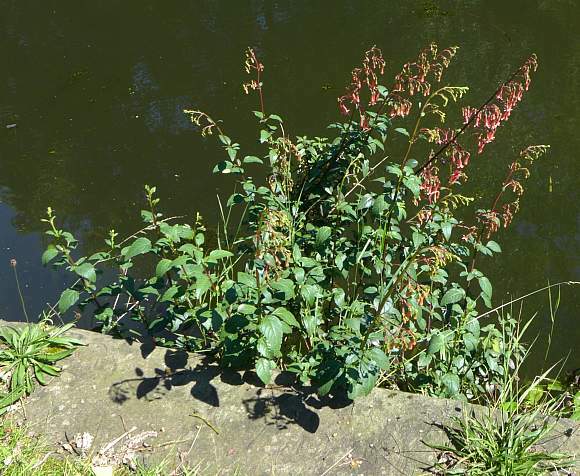 Distinguishing Feature : A 'figwort lookee-likee but one which has long, dangling, tubular flowers which are red. No relation to : Powell's Cape Lily (Crinum powellii), Cape Pigweed (Amaranthus capensis), Cape-Pondweed (Aponogeton distachyos), Cape Cudweed (Gnaphalium undulatum), Cape Tulip (Homeria collina), Cape Marguerite (Osteospermum ecklonis), Cape Wattle (Paraserianthes lophantha) nor to Cape Gooseberry (Physalis peruviana) [plants with similar names belonging to differing families].